Citation Information: J Clin Invest. 2005;115(8):2108-2118. https://doi.org/10.1172/JCI24682. Although increased external load initially induces cardiac hypertrophy with preserved contractility, sustained overload eventually leads to heart failure through poorly understood mechanisms. Here we describe a conditional transgenic system in mice characterized by the sequential development of adaptive cardiac hypertrophy with preserved contractility in the acute phase and dilated cardiomyopathy in the chronic phase following the induction of an activated Akt1 gene in the heart. Coronary angiogenesis was enhanced during the acute phase of adaptive cardiac growth but reduced as hearts underwent pathological remodeling. Enhanced angiogenesis in the acute phase was associated with mammalian target of rapamycin–dependent induction of myocardial VEGF and angiopoietin-2 expression. Inhibition of angiogenesis by a decoy VEGF receptor in the acute phase led to decreased capillary density, contractile dysfunction, and impaired cardiac growth. Thus, both heart size and cardiac function are angiogenesis dependent, and disruption of coordinated tissue growth and angiogenesis in the heart contributes to the progression from adaptive cardiac hypertrophy to heart failure. Generation of cardiac-specific inducible Akt1–Tg mice. (A) Schematic illustration of binary Tg system. 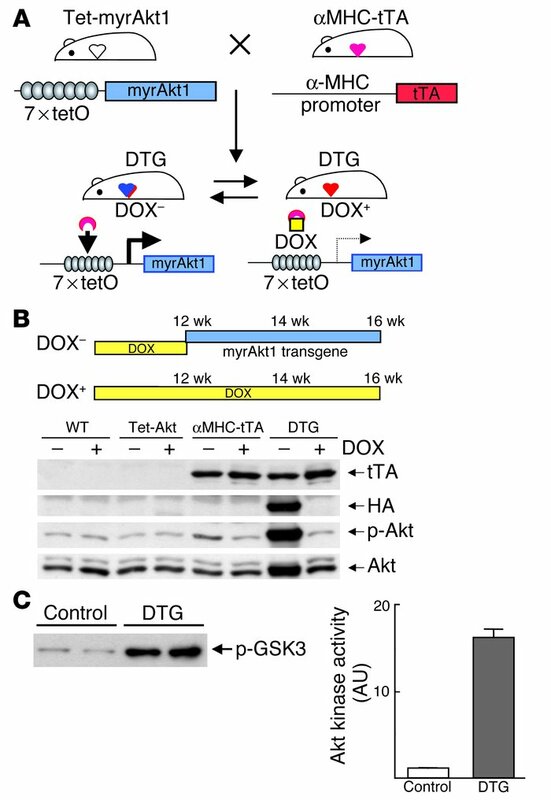 (B) DOX-dependent expression of Akt1 transgene. Top: Temporal profile of DOX treatment. Bottom: Western blot analysis of transgene expression. (C) Kinase assay in vitro. Left: Western blot analysis of Akt substrate. GSK3, glycogen synthase kinase 3. Right: Densitometric analysis of Akt activity.